The story of a peasant girl Bernadette Soubirous, a poverty-stricken, pure hearted adolescent, who saw a vision, of a “Beautiful Lady” near her home town of Lourdes in 1858. The wondrous news spreads rapidly throughout France, leaving in its wake a variety of consequences: adoration, suspicion and greed among the people of Lourdes skepticism from the town doctor (Lee J. Cobb) charges of insanity from the town prosecutor (Vincent Price) threats of physical punishment, then support and guidance from the Dean of Lourdes (Charles Bickford), who finally becomes convinced that the miracle has, indeed, taken place. Winner of four Academy Awards, including Best Actress and Best Score, this true story is both first-rate filmmaking and an inspiring tribute to faith, courage and the human spirit. I first watched it when I purchased the LD format more than 10 years ago and I still love this movie after watching it for numerous times! Not all religious movies are able to achieve the Spirituality which will touch both believers and non-believers alike, but this is definitely one of them. This is largely due to the powerful performance of the beautiful Jennifer Jones and the rest of the stellar cast. 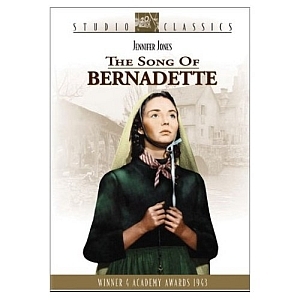 Saint Bernadette’s unwavering faith, her humility and serenity in suffering is astoundingly captured in this film through Jennifer Jones portrayal and a very well written script. Ridiculed, scorned and threatened by the ecclesiastical and political establishments, Bernadette must hold on to her integrity in order to survive. The realistic plotting and manipulations of the petty local politicians (led by Vincent Price) is worth the price of the DVD alone. Charles Bickford (nominated for best supporting actor) portrays the skeptical local priest who believes that he knows what is best for Bernadette in the end. Gladys Cooper (nominated for best supporting actress) is the vitriolic nun who despises and persecutes the poorly educated, sickly and simple minded Bernadette. The shattering emotional climax where the nun realizes the enormity of her sin is a master class in acting. This remains the most realistic religious film of the Studio era. Its hard hitting depictions of the poverty of Bernadette’s family, of the blindness of the Church and of a town’s small-mindedness is balanced by its literal depiction of the validity of Bernadette’s visions.